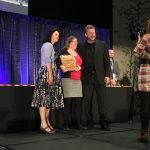 Amanda Sturgeon, CEO of the International Living Future Institute; Amy Johns; Jason McLennan, Chair of the Board of International Living Future Institute and founder of the Living Building Challenge. The LBC program, administered by the International Living Future Institute, is the most stringent measure of sustainability in the built environment. It certifies buildings that have positive, regenerative environmental and community components. To meet the challenge, a building must demonstrate that it can live within its means, using only the electricity produced and water collected on-site and devoting 35 percent of its landscaping to food production. Twenty imperatives determine ambitious goals in seven areas, known as petals: energy, water, materials, site, health, equity, and beauty. To date, only 11 buildings in the world have received full LBC certification. The center continues to work on the energy goal for the building, partnering with consultants who have worked on other LBC buildings to review energy consumption and generation for the building and explore ways to improve both. The consultants’ analysis suggests that the building is using approximately the amount of energy that the original model predicted, but that the solar panels are under-producing by about 20 percent. Williams hosts the panels and purchases the electricity from them, but SolarCity owns the equipment. The college is awaiting approval from SolarCity to have an independent solar engineer examine the equipment. Sitting in the heart of campus, the environmental center is open 24 hours a day, seven days a week. In addition to office space for the Zilkha Center and Center for Environmental Studies (CES), the building includes study areas, meeting and classroom space, and a kitchen that students may use to prepare and cook meals. For more information on the Class of 1966 Environmental Center, including group tours for college, school, or community groups, go to http://env-center.williams.edu.